This is in a great peaceful location For Rent. 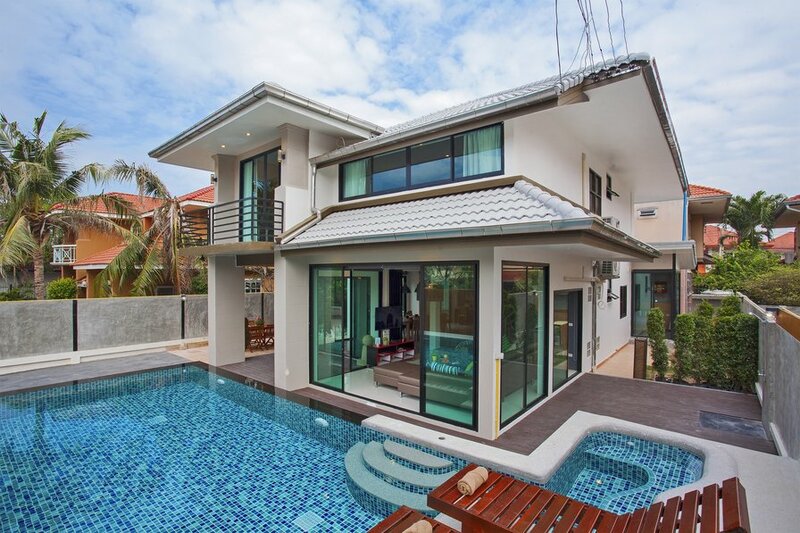 Pool Villa Coral is a modern themed property available for rent in Jomtien. Situated in a quiet gated location just 1.0 km from Jomtien beach. The newly refurbished 6 bedroom property has everything you need for a great tropical holiday. A large private swimming pool with a built in jacuzzi, perfect for relaxing plus an outdoor shower, sun loungers and a purpose built BBQ. Outdoor dining table, making this perfect for Al Fresco dining. The open plan living space inside of the villa is fantastic, with sliding doors in the lounge which lead straight out to the swimming pool. It has a large dining table, great for family meals and a new European kitchen. This luxury villa is beautifully decorated throughout to very high modern standard. Jomtien Beach, Pattaya Area Pool Villa Coral is located just 1 km from jomtien beach, making this a perfect location for all of your holiday needs. It is close to the Sukhumvit road making it very easy to get around. A 5-minute drive can take you to Makro, Tesco Lotus and Big C supermarkets, and its just a 15 - minute drive to Pattaya Walking Street. Pattaya Floating Market and Underwater world are within easy reach and excellent attractions. Jomtien is a very popular destination for families and groups with a wide range of international and Thai restaurants to cater for all tastes. Seafood restaurants are plentiful close to Jomtien's palm lit beaches by night, making a relaxed and romantic setting. There is 6 bedrooms in total. Two of the bedrooms are located on the ground floor with small garden views and fitted with en-suite bathrooms. The other 4 bedrooms are on the second floor, all bedrooms come with air conditioning, wall mounted TV's, wardrobes, safety deposit boxes, latex mattresses for extra comfort. Two of the second floor bedrooms have en-suite bathrooms, the third and fourth bedroom share a bathroom with separate access points. One of the bedrooms has a balcony overlooking the swimming pool. There is 6 bathrooms in total, 4 of which are en-suites consisting of shower, toilet and wash basin. All the bathrooms are nicely tiled in a classic design. There is a communal bathroom situated on the ground floor within the living area. The bathrooms all have hot and cold running water. There is also an outdoor shower for the swimming pool. Pool Villa Coral has a good sized European style kitchen which allows you to prepare and enjoy your own holiday meals with ease. The appliances consist of washing machine, electric hob, extractor fan, microwave, counter top oven, large fridge freezer, rice cooker, kettle, hot and cold water. There is also a purpose built BBQ outside of the villa. The spacious living area is warm and welcoming and consists of a fantastic large sofa, flat screen TV with 100+ international channels in six different languages (English, Russian, Thai, Chinese, Japanese and Korean). Perfect for watching movies or simply relaxing. The lounge area has large glass sliding doors leading straight to the swimming pool and patio. Joining the interior and exterior of this property in perfect harmony. A large dining table suitable for 10 people is perfectly located within the open plan living space near to the kitchen. A dining table for 6 people is situated outside on the left side of the villa enjoying its own patio area next to the BBQ.